Next week on 13-April at 8:00 AM PST Scott Guthrie will deliver a keynote address for the DevConnections conference being held in Las Vegas, NV. Scott will provide updates on the progress made in Silverlight 4 and will provide the details of availability of the developer tools, runtime and other news. 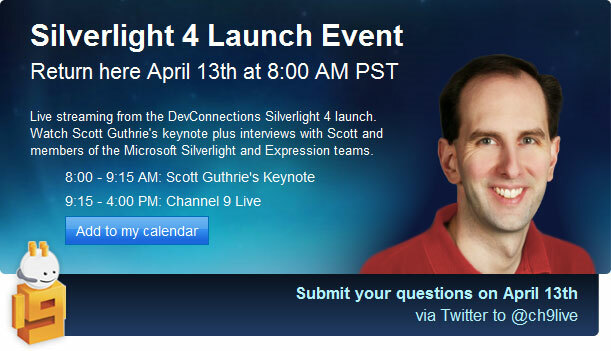 Mark your calendars and return to the Silverlight community site to tune into the LIVE event. After the keynote, Channel 9 will be hosting interviews with Scott and other key members of the Silverlight and Expression teams. I’ll be hosting one of those interviews as well and look forward to your submitted questions via Twitter to @ch9live.